Although the Aryan invaders derided Shiva, the Dravidian God and the parent of Ganesha as Sishna Deva (Phallus God) and made the Holy Elephant as the mount of their chief God Indra, in subsequent years, the Aryan people from the land of Iran began to recognise the greatness of the prevedic culture. With this recognition Shiva became an important God, replacing Indra and the title of Ganapathy indicating the lord of hosts used by Indra was conferred on Shiva also. Not long after, Ganesha who was already a prevedic Deity and who had a good deal of esoteric metamorphosis forced himself into the Hindu pantheon appropriating the title of Ganapathy exclusively for himself. By this time, Indra the Chief of the Gods of the Aryans, degenerated himself into a philanderer. In one of his foolish sprees he got into a mess with sage Gauthama's Wife whom he seduced under impersonation. As a reprisal Gauthama effectively cursed him with a dire affliction of having female organs all over his body. Indra went into hiding and being told that only Ganesha will be able to cure him of this unseemly malady, he prayed to Ganesha for a cure. 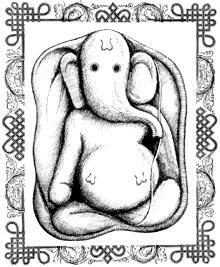 Ganesha appeared before him in answer to his prayer and initiated him into the practice of yoga. Indra practiced yoga implicitly following Ganesha's advice and thanks to the power of yoga, he became his former self again. Shiva had already been recognised as the lord of yoga and this legend besides recognising Ganesha as another lord of yoga is also designed to show the superiority of yoga practice over the ritualism of yaga, of which Indra is considered as a patron. In this legend, importance is given to Ganesha and not to Shiva by Indra and this made Ganesha as the universal God. His devotees began to call him by a thousand names, each name denoting a divine attribute that he is said to represent. His image also became an object of worship with elaborate rites.